There is a constant danger that putting a thumb in the dyke in one part of the financial system will cause a leak to spring somewhere else. It’s a danger that well-intentioned reforms could push risk to ever-darker corners of the financial system, to financial products not yet envisioned by even the most farsighted regulators. … This is not to say, as some have suggested, that the art of financial regulation is a futile endeavor. … It just means that we should approach the constantly evolving landscape of the financial sector with, in my opinion, a deep sense of humility about the capacity of any one set of reforms or safeguards to permanently preserve the stability of our kinetic, frenetic, global financial system. Hyman Minsky had definite views about how the financial structure should (and should not) be altered so as to create a more stable and prosperous capitalism, but he also emphasized that the work of financial regulation is never done. It is part of the nature, part of the bargain, as it were, of finance-driven capitalism that new practices and sources of instability are constantly emerging. The net interest projection is based on assumptions about what policy decisions the Federal Reserve will make in the future; in this case, the Fed is assumed to raise interest rates substantially. The deficit tops out at 3.5 percent of GDP in 2023 in the latest CBO forecast (which is just above the 40-year average of 3.1 percent of GDP), but it continues to climb outside of the 10-year window, and this is what has many people concerned. The CBO’s assumption, which is that the United States must offer a real interest rate on the public debt higher than the real growth rate, by itself creates an unsustainability that is not otherwise there. … Changing that one assumption completely alters the long-term dynamic of the public debt. By the terms of the CBO’s own model, a low interest rate erases the notion that the US debt-to-GDP ratio is on an “unsustainable path.” The prudent policy conclusion is: keep the projected interest rate down. Otherwise, stay cool. Whether it’s the terrible growth numbers in the eurozone (Eurostat), the revelation of spreadsheet errors in everyone’s favorite debt disaster study (for some of the non-spreadsheet-based problems with the Reinhart-Rogoff approach, see this 2010 working paper), or the fact that the US federal deficit is on track to shrink to a measly 2.1 percent of GDP in two years (CBO report here), the past couple months have offered up some embarrassing and inconvenient news for those who continue to push for austerity. Nonetheless, we’re unlikely to see any of this dramatically alter the budget debate, and the key to understanding why is to appreciate that there is a significant constituency among austerity supporters for whom most of this data is irrelevant. It’s not just that this information isn’t likely to persuade them, but that for a certain species of austerian, it couldn’t possibly. After four years of fiscal fear-mongering, it has become clear that for some ostensible austerity supporters, it was never really about the deficit. 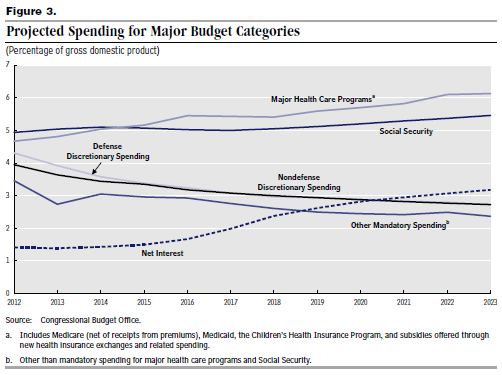 With last week’s updates, the CBO now predicts that the budget deficit will fall to 2.1 percent of GDP by 2015. If that number means nothing to you, consider that the original Bowles-Simpson plan — the standard by which budget seriousness is measured in the press — called for a 2015 deficit of … 2.3 percent of GDP. Pikers. Yet, revealingly, there are some deficit hawks who are treating the rapid shrinking of the deficit as bad news — and not for the Keynesian reason that this indicates the government is failing to do its part in supporting the economy, as Bernanke stressed in his remarks yesterday, but because the disappearing deficit is easing congressional pressure to pass “entitlement reform” (which, as we’ll see below, does belong in scare quotes). There are important changes in how many developing countries are approaching the problem of poverty. Specifically in the area of “social protection” policy — policies intended to prevent or alleviate income insecurity and poverty — these changes are reflected in attempts to move beyond one-off interventions and “safety nets” to policies designed to address some of the underlying problems causing economic vulnerability in the first place. The first addresses income poverty by enabling women to participate in the economy as consumers, which they otherwise cannot do on their own. The second, in the case of free rationed food, allocates food directly to those deserving of support because of their destitute status and inability to cope. The third approach addresses the income gap through means that enable the beneficiary to engage in the economy as a producer.While all three reduce an identified deprivation, the last one acknowledges it as an outcome of social relations of exclusion in production (i.e., women farmers do not have access to necessary agricultural inputs and support systems) that often underpin people’s experiences of chronic poverty and vulnerability. A couple of weeks ago, I mentioned Hyman Minsky’s new book, Ending Poverty: Jobs, Not Welfare (there is also a Kindle version). Take a look at the cover – Minsky looking like a bit of a rougue! I thought you might enjoy my powerpoint presentation, given at the Levy-Ford annual Minsky conference in NYC in mid-April. It summarizes some of the main arguments of the book. However, you really need the book – it is brilliant, and a good antidote to all the silly arguments made by economists that we “need” to keep tens of millions of Americans unemployed. the eurozone was to involve the inclusion of independent states, with highly diverse economic systems and cultural settings, that were required to give up national currency sovereignty in exchange for a “foreign” currency without the backing of a treasury or a central bank ready to act as lender of last resort in the event of a financial crisis. Germany has adopted toward the indebted eurozone member-states the same policy it carried out with regard to East Germany after unification: the destruction of its industrial base and the conversion of the former communist nation into a satellite of Berlin. The bank rescues masquerade as the rescue of nations, and are followed by the enforcement of unbearable austerity measures to ensure repayment of the “rescue” loans. Then comes the implementation of strategic economic policies aimed at reducing the standard of living for the working population and the shrinking of the welfare state, complete labor flexibility, and the sale of public assets, including state-controlled energy companies and ports. This constitutes the German strategy for pillaging the debt-laden economies of the Mediterranean region. A Budget Surplus by 2015? That’s the implication of a James Pethokoukis post linked to here by Reihan Salam. Let’s assume for the sake argument that a federal budget surplus does emerge in 2015 (yesterday’s CBO report projected the 2015 deficit would be a mere 2.1% of GDP). Salam expresses concern that such a scenario would leave Republicans, who have been banging the austerity drum since inauguration day 2009, in a political and policy bind. It would allow Democrats to declare “mission accomplished,” as Salam puts it, leaving Republicans with no agenda. In a new policy note, Jan Kregel draws out some of the policy lessons of the Cypriot deposit tax episode for plans to create a system of EU-wide deposit insurance. In addition to the necessity of a strong central bank (the ECB in this case) standing behind the deposit insurance scheme (which does not appear to be part of the current plans), Jan Kregel explains why a certain amount of moral hazard is inescapable. We can see this by looking at two types of deposits that correspond to the dual functions of banks: deposits of currency and coin, and deposits created when loans are made. If a bank makes bad loans — and as Kregel points out, “it is the failure of the holder of the second type of deposit [loan-created deposits] to redeem its liability that is the major cause of bank failure” — the first type of depositor (of currency and coin) should not bear the brunt of these bad decisions. The role of deposit insurance, one might argue, is to provide such protection. Unfortunately, it is impossible in practice to make these distinctions between reserve deposits, defaulted-loan-created deposits, and deposits created by loans that are current. It is for this reason that there are limits on the size of insured deposits based on the presumption that the first type of deposits will be relatively small household deposits created by the transfer of reserves and used as means of payment or store of value. It thus limits coverage of the other types of deposits. However, this is clearly inequitable for the deposits held by borrowers who are still current on their loans. Narayana Kocherlakota is the head of the Federal Reserve Bank of Minneapolis and is known for an uncommon feat in high-level policy circles: he changed his mind. Originally a monetary policy hawk, Kocherlakota has become a supporter of looser Fed policy. He spoke recently at the Levy Institute’s Minsky conference in New York, and some reports of the speech–at least as rendered by headline writers–may create the impression that Kocherlakota has been reconsidering his conversion.